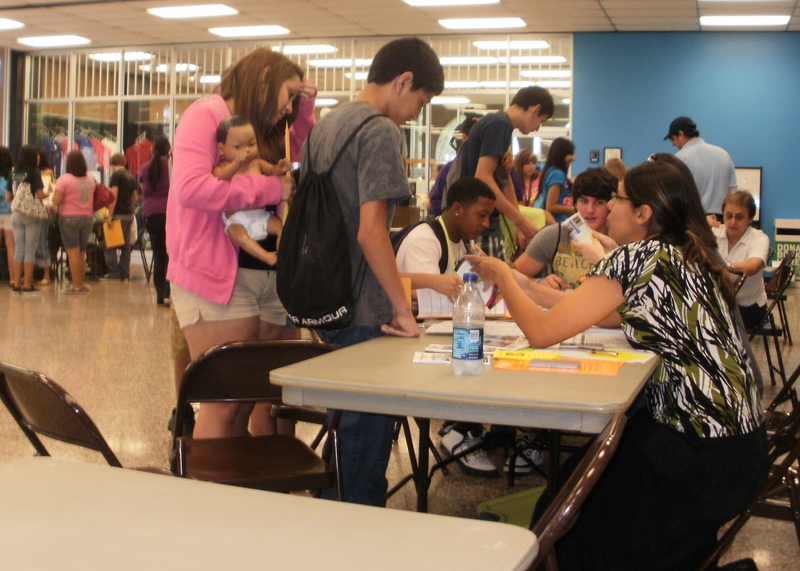 Brianna Cano, left, of Beeville, considers her options while Stella Ressio, an Upward Bound math instructor and Independent City volunteer, advises another student on finding affordable housing. Suppose you were a single parent, trying to earn a college degree while raising a family? What if your parents paid for college but nothing else? What would you do? Where would you live? How could you afford the lifestyle that you are accustomed to? These are tough questions for anyone to answer. That is why Lupe Ganceras puts teens to the test in Independent City. Coastal Bend College TRiO students were faced with some daunting tasks during a recent visit to Independent City, a program that gives high school students a glimpse at the real world. The James R. Dougherty Jr. building at the college was transformed into a busy little town. Under the supervision of adult “friendly neighbors,” students had to find roommates and visit various city stations. They had to shop for supplies and furnishings for their new homes and explore their college/career potential. Each student was given a paycheck and a bank account. Then, they were sent into the “city” to obtain utilities, find an apartment, get a driver’s license and navigate life without parents. Some were assigned the extra burden of being single parents. Volunteers from IBC Bank – Beeville; Texas WorkForce, City of Beeville Utilities, Bee County Health Department and Coastal Bend College assisted students in Independent City. While many teens say they are dying to leave home, many are fearful. Few actually know what to do in the real world. Independent City helps prepare teens for some of the realities that go along with independence.